“On the fifth Sunday in October 1909 a presbytery composed of Dr. H.A. Brown (pastor, First Baptist Church of Winston-Salem), Fred Day (jeweler and prominent evangelist), and W.H. Wilson met at Union Hill Methodist Church and organized what is to be known as Quaker Gap Missionary Baptist Church. The dedicatory sermon was preached at 11 o’clock a.m. by Reverend H.A. Brown. After an intermission of one hour the presbytery met and organized the church with . . . charter members who joined at a meeting held (in the brush arbor) at Haw Pond Schoolhouse August 1909 by W.H. Wilson” (taken from the original minutes of Quaker Gap Baptist Church) After the organization, other members for the new church were received by letter from Mt. Olive, Friendship, Germanton, and Bethel Baptist Churches. Rev. W.H. Wilson was called as the first pastor of Quaker Gap and the first deacons were elected on November 27, 1909. The original trustees, W.G. Slate, W.J. Johnson, and J.H. Ferguson, purchased a plot of land and collections began for material to build the new church building. 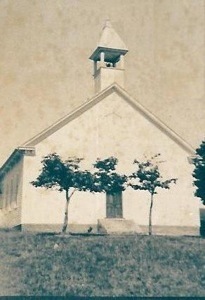 Until the first structure was completed one year later, in November, 1910, Quaker Gap continued to meet at nearby Union Hill Methodist Church. In the years that followed, Quaker Gap experienced a great amount of growth. The first revival meeting was held on July 21, 1911, where 25 members were added and baptized in the “race” of the old Slate Mill pond. Members continued to be baptized in the “race” or at the YMCA Camp lake until a baptismal was built in 1921. 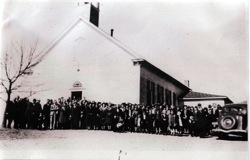 In 1929, work began towards adding two needed Sunday School classes to the church building. When Quaker Gap started, meetings were only held once a month. As it continued to grow, meetings were eventually increased to twice a month and we shared a pastor with a another church in the area. In 1951, the decision was made for Quaker Gap to enter into “full time” work. A parsonage was built and dedicated in 1953, while Quaker Gap called its first full time pastor, Rev. W.A. Laudermilch. Continued growth led to further construction of new educational space. 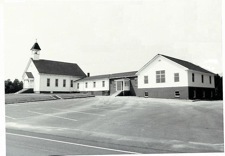 In 1960, ten new classrooms were completed, along with extensive remodeling of the existing facilities (including the addition of an indoor baptismal). A fellowship/education building was added in 1988 and more additions to the sanctuary were completed in 1995. In addition to the physical growth of the church building, Quaker Gap expanded its staff to meet the needs of a vibrant community of believers. In 1993, our first Youth Minister was hired. When this position was expanded to full time in 2000, an Associate Pastor was also added to the staff. 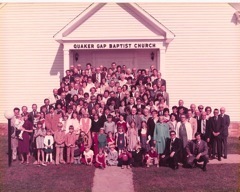 In 2002, Quaker Gap added a Minister of Music to the Staff. We have also been greatly assisted by summer interns, our wonderful Ministry Assistants in the office, and an indispensable group of lay volunteers that lead many of our ministries. At the very heart of what makes Quaker Gap tick is a passion for missions. Only a few months after our founding, we received our first offering for home missions on March 26, 1910, which amounted to $4. A month later, the first offering for international missions was collected in the amount of $8. From that humble beginning, Quaker Gap has expanded this passion for missions to our local community through prayer walks, ramp building, mission blitz days, wood cutting, volunteering at local outreach organizations and shelters, working with Habitat for Humanity, and even assisted in building a house for one of our own members.